Welcome to bagger basics. 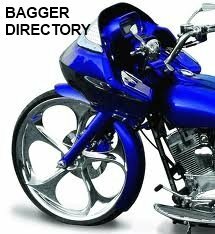 On this page you will learn that each Harley Davidson touring motorcycle (bagger) has its own characteristics, purpose and attitude. Touring motorcycles are about more than having saddle bags for extra storage. Depending on the year and model touring motorcycle you choose. I have listed several standard and optional equipment that's available to help you make a informed choice. 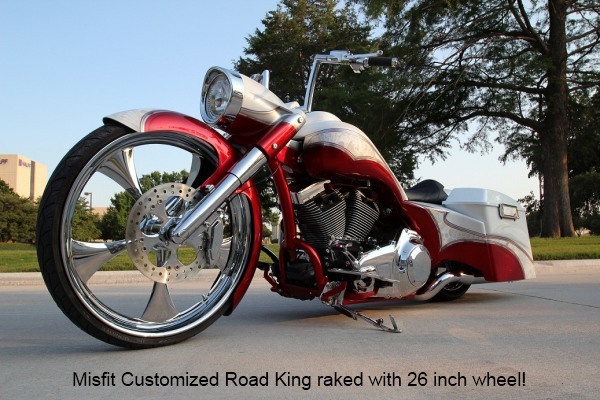 The Road King has a retro cruiser appearance. It has one large head light and comes with a detachable wind shield. 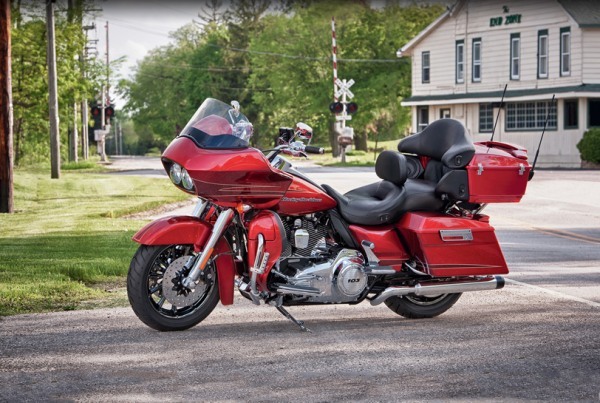 Remove the wind shield and add some custom styling of your own and the Road king can easily be considered the sportiest of all the touring motorcycles. While the Road King doesn't come equipped with a radio from Harley. There are several options to choose from to add any amount of music to your ride. If sticking with Harley is your choice, they offer handle bar mounted speakers with iPod jack. Also available speakers that mount in lower fairing that are attached to your high way bars. Speakers can also be installed in saddle bag lids. Both options are offered with Harley or aftermarket. The Road Glide Custom has a frame mounted fairing with unique dual head lights. This motorcycle is called the shark nose because of the shape of it's fairing. Benefits of a frame mounted fairing is quicker steering response, because there's no added weight on the handle bars. Maneuvering the motorcycle my tend to feel lighter than the other touring motorcycle in Harley's line up. 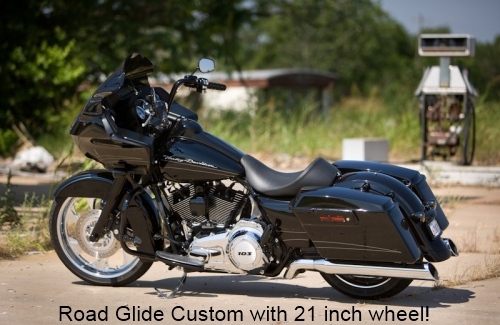 The Road Glide comes standard with a Harman/Kardon audio system with CD and iPod input. The Street Glide has its fairing mounted to the handle bars with one head light out front. This bike is also known as the "bat wing". 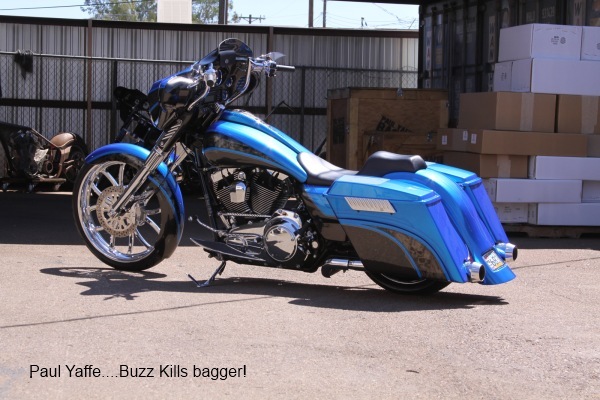 The Street Glide has been one of Harley's most popular baggers for several years. The Street Glide also come with audio system in its fairing. 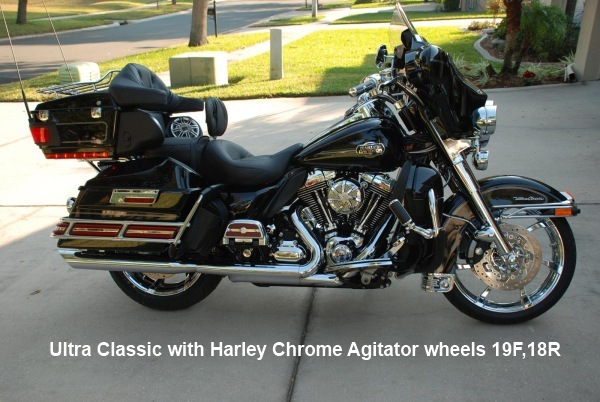 The Ultra Classic models are offered with a handle bar mounted fairing or bat wing. The Road Glide has a frame mounted faring or shark nose. Both bikes are all about having the the most comfort and maximizing storage. They come with increased ride height for better ride quality. The Ultra's are known for the tour packs with passenger back rest and rear mounted speakers. They are also equipped with CB radios and intercom system. This motorcycle is also known as Harley's full dresser. All Harley touring motorcycles ride on the same frame. Depending on the year it will have a five or six gallon gas tank. They are all powered by a rubber mounted V twin air cooled motor and drive train that helps isolate the riders from vibration to give a smooth touring ride experience.